I've seen on lots of homeschool forums and groups where people have decided to homeschool, but have no idea how to start. Or maybe they have suddenly been forced into homeschooling and REALLY have no idea where to start. I'm putting together a series of posts on how to get the homeschooling ball rolling. I've only been homeschooling for 4 years (if you count Pre-K which some people don't), but I'm a type A personality, and I love to research. I would love a job where someone just wanted me to go find information for them all day long. So those are my "credentials" for writing these blog posts. I'm writing these posts from the perspective that your family has already decided to do this. Hopefully you've prayed/meditated over the decision and know that this is what your family needs. Make sure that everyone is on the same page. Homeschooling is hard enough (it is a full time job!) without having a united effort. The first and most important part of this process is to know the law in your state. Each state has legislated rules that home schoolers must follow, but rest assured that homeschooling IS legal in all 50 states. The hoops you have to jump through are more numerous in some states than others. The easiest way to find out the laws where you live is to go to the Home School Legal Defense Association (HSLDA) website, then click on your state. Once you get to your state's page, you can click on "Laws" and it will bring up the information. 1. Your local library. As a homeschooler you will be spending quite a bit of time here and so do other homeschoolers. Simply show up at the library in the middle of the day while school is in session, if there are school age children there, then they are probably homeschooled. Or you can just ask the librarians if they know any local homeschoolers and leave your number for them. 2. Do an internet search for homeschool groups in the area. Search for homeschool groups and the name of your town. Hopefully something will come up, unless you live in the middle of nowhere (which is possible). 3. Find an online homeschool community. There are quite a few homeschooling forums out there that have wonderful men and women who are more than happy to answer your questions. One of my favorites is the Well-Trained Mind forum. People from all over the world post on it, so someone is sure to have an answer for your questions, even if you are not a classical homeschooler. Exactly what is a classical education, a Charlotte Mason philosophy, traditonal homeschool, unit studies, or unschooling? These are all terms that homeschoolers use to define their educational plan. While I have an education degree, I had never heard any of these terms until I started homeschooling, but they are very important to understand. It is also very important to understand what kind of a learner you have (this stuff I did learn in my college education classes). There are visual, auditory, and kinesthetic learners (and combinations of all three!). Basically, in layman's terms, the readers, the hearers, and the doers. So now you are thinking, "There is no way I will ever figure all of this out!" Lucky for you, there is a book that I recommend to everyone starting their homeschooling journey: 100 Top Picks for Homeschool Curriculum by Cathy Duffy. It's not necessary that you buy the book (I did just because I knew I would be referencing it a lot!). You should be able to check it out from your local library or if they don't have it, then request it through inter-library loan (ILL). If you don't know how to request ILL books, then this is a good time to learn! You will be doing this a lot as you homeschool. While not everyone agrees with her reviews of homeschool curriculum, this book is invaluable to the beginning homeschooler because of the beginning chapters where the book walks you through figuring out what kind of educational philosophy you lean towards and what kind of learners your children are. Both of these things will help guide you as you start trying to figure out what you need to buy to educate at home. It's also good to note that your educational philosophy can change as you homeschool. I started out fitting firmly in the classical education camp, but last year I found myself drifing much more into a Charlotte Mason education. Now I call myself a "classically Charlotte" educator because I pull from both philosophies. 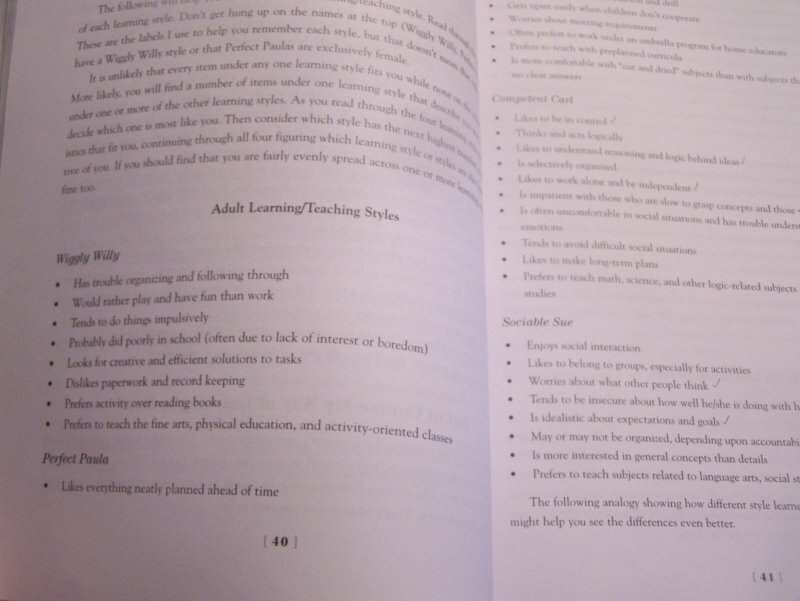 After you fill out the chart, the book then goes on to tell you about each of the categories so that you can understand a bit more about what unschooling, unit studies, etc. really means. For further reading, there is a list of books mentioned at the end of the section that go in depth on each one. Once you know "how" you want to teach, you get to figure out "how" your children like to learn. 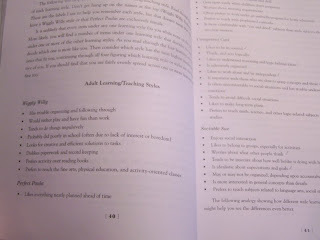 In chapter 4, the book gives you a little insight into what kind of learners you have on your hands. While the book ascribes monikers to each learning style, such as a Wiggly Willie, don't let the genders confuse you. I have a Wiggly Wilma on my hands, so not all "wigglers" are boys! 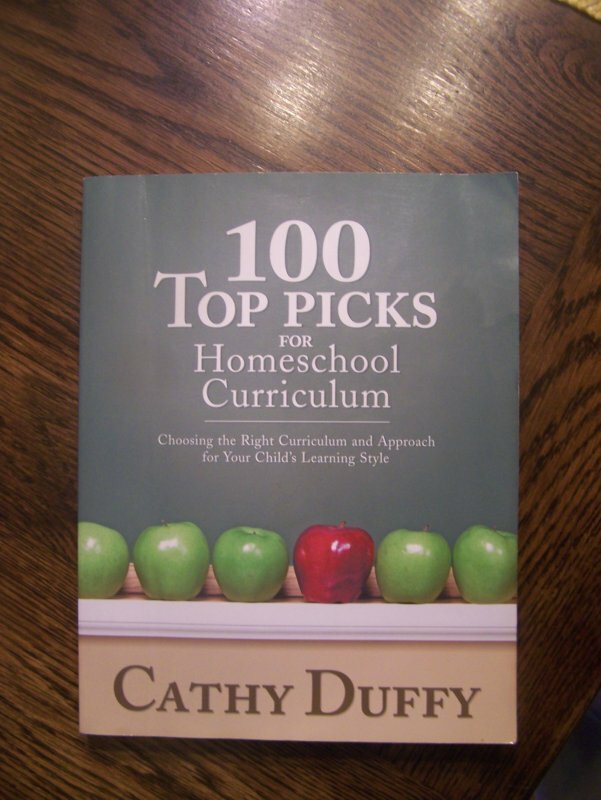 The bulk of the book after these initial chapters is dedicated to reviews of Ms. Duffy's opinions of what the Top 100 homeschool curricula are. 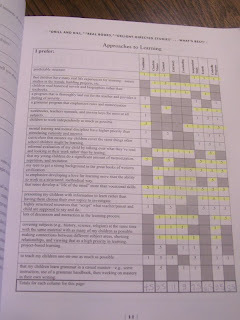 She begins the reviews by giving a chart of the Top 100 broken down by educational philosophy, learning style, and subject. So say you like Charlotte Mason education, have a Wiggly Willie, and are teaching phonics. The chart will help you figure out exactly which program would best suit all of that criteria. The Top 100 list is not exhaustive, not even close! The homeschool market is booming as more and more people choose to homeschool, so just because something is not on the list doesn't mean it's not a good program.